Still Dreaming About Mr. Darcy? Silly, I know. It’s not an important question, really. It’s nothing profound, but it stuck to me. Then… my good friend suggested Mr. Darcy. That, I was quick to deny but honestly, I was too quick to deny. I do love Mr. Darcy as most girls who have encountered him do. However, it’s been ages since our first encounter and I’d like to believe I have grown up over the years, so why is he still in my mind? What does he mean to me? Let me now switch to second person (as I’m very much a person in denial) whilst I try to make sense of Darcy’s strange allure. Lizzy Syndrome. If you are like most girls, you probably grew up dreaming about that one man who’d defy the world for the sake of his one and only love. Over the years and after a few painful encounters, however, you would have modified this image to suit reality better, until what remains is a substandard albeit more realistic image of the original dashing man of your dreams. Some of you would find this process sad. In the deepest recesses of your heart, there’s a stubborn part that still believes in true love, magic, and happily ever afters. In this case, you and Lizzy would be very much alike. She was a rational woman who secretly dreamed of that one great love that would her sweep her off her feet. You both, whether you’d like it or not, are fools in love. Awkward Men. Then come men like Mr. Darcy – brooding, mysterious, and quirky. The Mr. Darcys of this world will wind you up, fluster you, and test your whole concept of that which is ideal. On one hand, you are loath to spend even a moment in his company but on the other, you are also left intrigued and completely drawn in by his mysterious and infuriating air. Later on, you might find that all his annoying habits are the result of awkwardness rather than spite. This will melt your heart a little and will cause you to think of him in a more favorable light. The Proposition. 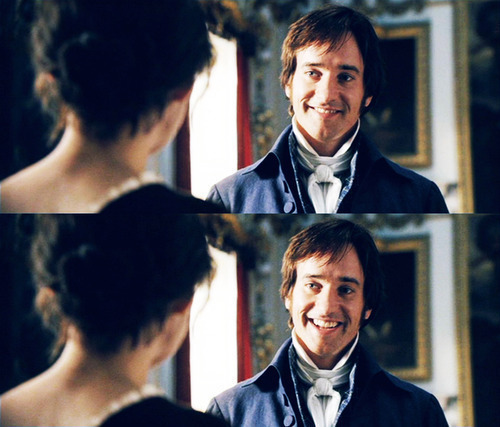 In true Mr. Darcy fashion, he’d once again shake your world with a completely unexpected profession of love. All that passion in a man who previously appeared to be so cold will confound the mind. What of the neat little boxes that perfectly categorized every person you have met before? This man does not fit any of these. This frustrates, annoys, and confounds you. Denial and Anger. Elizabeth Kubler-Ross first introduced the Five Stages of Grief in 1969 when she published her book, On Death and Dying. The first two stages include Denial and Anger. In this scenario, confusion rather than grief reigns yet the first two stages still apply. In your confusion, the first instinct would be to deny that the proposition has actually occurred. Then, your suspicious nature will creep in and in disbelief, you’d speak out in anger. This man, with a few mere words, has managed to shake your world with such magnitude. How dare he? How could he? At this point, you will feel your precious control – the thing you’ve been clinging on to all your life to keep your sanity – slipping away. A Miracle. By this time, indecision would have completely occupied your days (and nights). On one hand, self-preservation assures that you have done the right thing by shutting that terrible man out of your life. On the other, there’s this voice, one that’s rarely heard but is most treasured, telling you that you have done wrong. Then, when everything seems to be going wrong, he’d flash you one his rare, glorious smiles. That’s when you know that you’re a goner and that you’d do anything to see him smile again. Only when you decide to love despite your fears can you truly appreciate how beautiful the experience is. 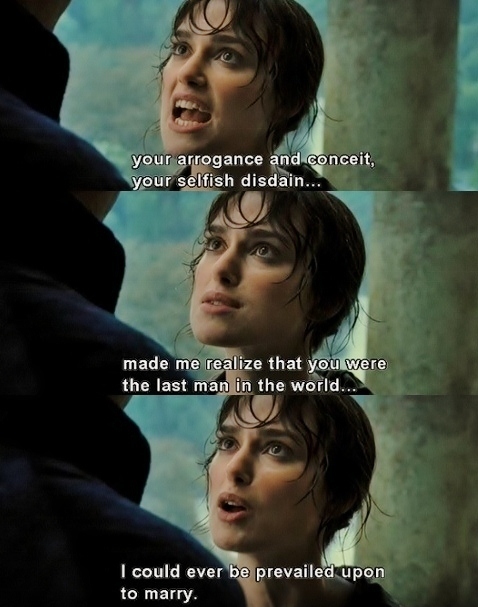 And that’s perhaps why I love Mr. Darcy. He has shown me how love can be so wonderful and precious. People say that even after years and years of experience, your first love will always be memorable. 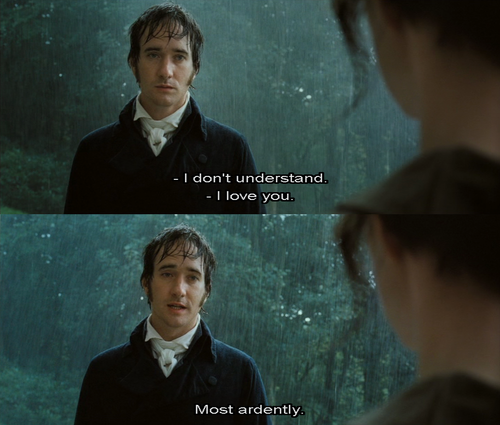 Thus, Mr. Darcy, being my first love, will always have a special place in my heart.